For years, “defense” in portfolios—i.e., allocations to cash and core fixed income holdings—has meant a willingness to accept extremely low returns. But after many years of economic recovery, we finally have reached a point where defensive allocations once again provide a reasonable yield. Many noisy political topics have dominated the investment discourse in 2018, but underneath that noise and volatility, the drum beat of rising interest rates in the U.S. has been steady and consistent. After nearly a decade sitting near zero, the effective Fed Funds Rate (as tracked by the St. Louis Fed) rose above 50 bps at the end of 2016, and since then has ticked up to 180 bps as of June 30, 2018. While still low by historical standards, the Fed’s hiking has spurred rates elsewhere (the 10-year Treasury yield briefly poked above 3% in April, and now sits between 2.8% and 2.9%). Valuations are elevated. This is true in various regions, but particularly true in the U.S. Robust Q1 2018 earnings growth improved the valuation picture for U.S. stocks, but they are still pricy by historical standards. It is worth noting that valuations are more reasonable in developed international and emerging markets; however, U.S. valuations are critical given the large role that U.S. stocks play in most investors’ core equity allocations. Meaningful political and economic risks exist for stocks. We discussed some of these risks at length in our 2018 asset allocation report, “Confronting the Unknown.” While the military threat in North Korea has, for now, appeared to recede, the potential impact of protectionist trends on global trade has only strengthened since we issued our report earlier this year. Source: Bureau of Labor Statistics for unemployment data; Bureau of Economic Analysis for inflation data; U.S. Treasury for yield spread data. 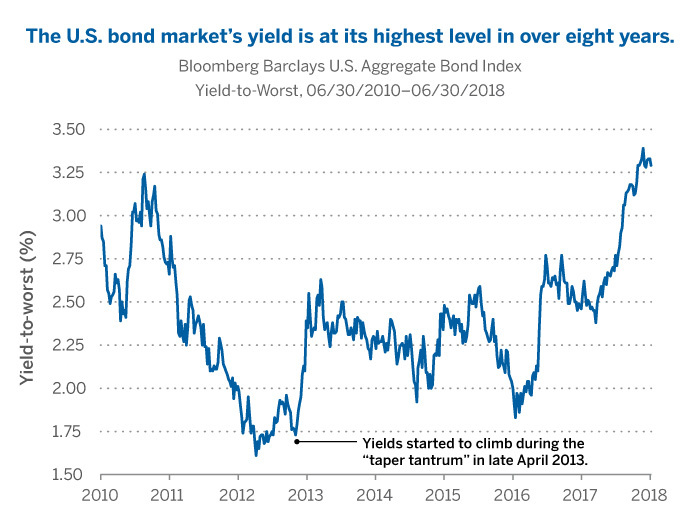 With all of this in mind, we believe that bonds have gained some ground on stocks in terms of the risk and potential reward each asset class represents. The opportunity cost of defense is lower today than it has been in many years. Yield-to-Worst (YTW) is the lowest potential yield that can be received on a bond without the issuer actually defaulting. The YTW is calculated by making worst-case scenario assumptions on the issue by calculating the return that would be received if the issuer uses provisions, including prepayments, calls or sinking funds. This metric is used to evaluate the worst-case scenario for yield to help investors manage risks and ensure that specific income requirements will still be met even in the worst scenarios. Bloomberg Barclays U.S. Aggregate Bond Index is a market capitalization-weighted index, meaning the securities in the index are weighted according to the market size of each bond type. Most U.S. traded investment grade bonds are represented. 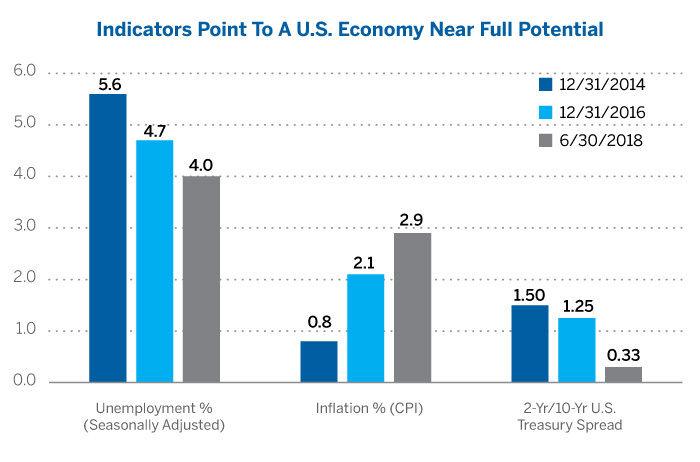 Municipal bonds, and Treasury Inflation-Protected Securities are excluded, due to tax treatment issues. The index includes Treasury securities, Government agency bonds, Mortgage-backed bonds, Corporate bonds, and a small amount of foreign bonds traded in U.S.